Well hey there! Thanks for stopping by. I look forward to sharing my life with you, both on and off the track. Its a hectic life balancing motherhood, professional sport, investing and life in general, but the adventure is all worth it! Chaunte's high school coach didn’t want her to try the high jump because he wanted to keep her in the sprints. Little did he know that she would go on to become one of the best high jumpers not only in the U.S., but also the world. 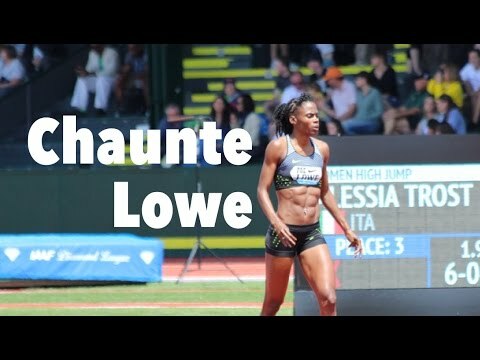 After moving across the country to study at Georgia Tech, where she would earn a degree in Economics, and train with jumps coach Nat Page, Lowe was able to realize her childhood dream of going to the Athens Olympics at only 20 years old, making her the first woman from Georgia Tech’s track and field team to become an Olympian, which she would repeat in Beijing (2008), London (2012), and Rio (2016). In 2005, Chaunte won a silver medal at the World Championships to become the first American woman to do so since 1983. On her competitve nature, Chaunte says, "Every day I step on the track my goal is to work harder than every other person in the world. I feel like it is a competition, and one that I always try to win." Though bittersweet, Chaunte has been retroactively awarded the 2008 Olympic bronze medal after athletes originally ahead of her received bans for doping and cheating. "This completely rewrote my Olympics story,” said Chaunte. A wife and mother of 3 kids, Chaunte is an avid invester who loves teching what she knows and motivating others. She intends to continue to use her skills to empower others, aiming to open a speed and agility training facility as well as offer summer sprint camps for kid, in addition to teaching ab, weight loss, and nutrition classes virtually using what she has learned over the years to help others. Fitness is not her only game, as she seeks to use her investing and finance knowledge as well to assist her fellow athletes in creating roadmaps to follow for their own financial health.